(back left, next to Mr Drabble). 5th Volunteer Battalion., Hampshire Regiment. Charlie White was born in 1870, the eldest son of Isaac John Long White and Maria (née Hawkins) of Stag Road, Lake, Isle of Wight. He was Christened William Isaac but later opted to be known as Charles, possibly after the death of his son Charles in 1906, although this is pure speculation. His grave marker shows him as Charles W I White. Charlie joined the Volunteers in 1893 and by 1908, when the Volunteers became a Territorial Battalion, he was a Colour Serjeant and a crack shot (according to the report of his death in the local paper (see below) - The Isle of Wight Chronicle, Thursday, July 21st 1932). Edward, aged 10, Leonard, aged 2½ and Winifred Carrie, aged 1½ were all buried on 23rd February 1911 in Christchurch Graveyard, Broadway, Sandown. There are family stories of three small, white coffins in the church. They share a grave with their brother Charles who died in 1906. 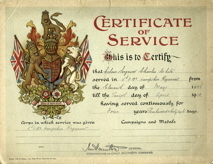 Around June 1916, son George was assigned to 14th Battalion Hampshire Regiment, and served on The Somme until late December when the 14th Hampshires moved to an area near Ypres. In his last letter home, dated 20th September 1917, George says "Tell Dad I'll not worry about anything for his birthday now, but will make up for lost time when I do come home, which I hope won't be very long now". He was killed in action six days later. Former Crack Rifle Shot and Volunteer Sergeant. Well known some years ago as a crack shot and winner of many prizes on the ranges, Mr. Charles White, of 2 Stag Road, Lake, passed away very suddenly on Sunday morning in his 62nd year. Mr. White, who had been medically attended for some time on account of heart trouble, was at work as usual on Saturday and in the evening went on the cliffs to look at the warships at anchor in the Bay. He had lived in Lake all his life and worked as a carpenter for Messrs. F & L. Whittington. Some of his leisure time was devoted to the honorary secretarial work of the Stag Inn Slate Club and he was also associated with the Working Men's Club. Many will remember Mr. White as a sergeant in both the old Isle of Wight Volunteers and those formed during the Great War. 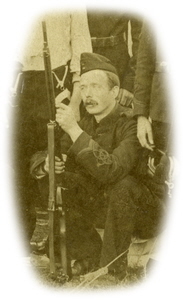 His skill with a rifle brought him into prominence locally and he was given the post of instructor at the range provided by Mr. G. C. Drabble for training purposes during the War. Charlie shares his grave stone in Lake Cemetery with George but even fifteen years later, George is decribed as "missing at Passchendaele".